Are you getting a little hypnotised by those spinning reels? Is your bankroll taking a battering from a bad run on a high variance online slot? 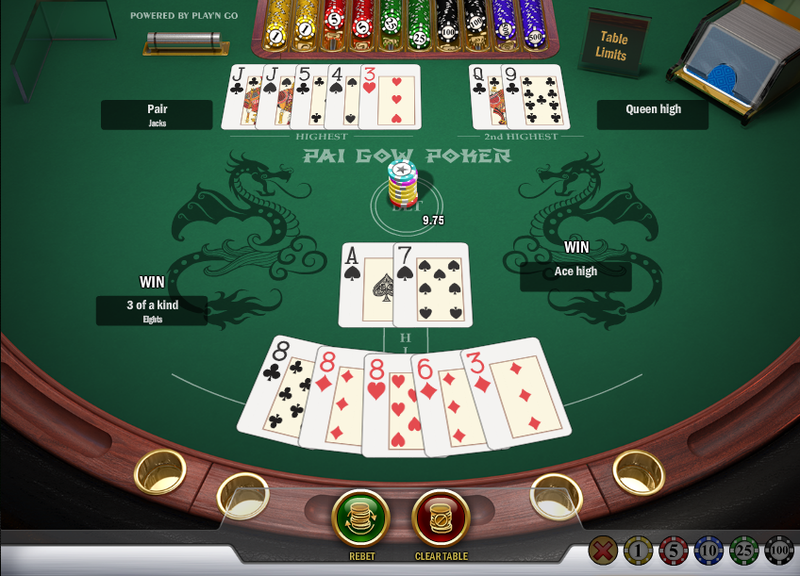 If so then it may be time to try something a little different so here we present Pai Gow Poker. This version is developed by Play N Go and unlike Texas Hold’em or Seven Card Stud for example, it’s easy to learn and involves only a little strategy. In this version you are playing against the dealer only and the aim of the game is to form two hands from the seven cards dealt to you – a pair and a five card hand. This is a 53 card deck meaning that it includes one joker which can substitute for an Ace or to complete a straight, flush or straight flush. So the plan is to form two hands as described above and to beat the dealer with both hands. If you win both hands you will double your stake, win one hand each and it’s a ‘push’ which means your stake is returned. The dealer wins if he wins both hands or if a hand is tied (the tie constitutes the house edge). When choosing how to split your hands, bear in mind that the five card hand must be of a greater value then the two cards. Begin by selecting your bet size with the chips and then click the ‘Deal’ button to receive your cards. You can now split your cards manually or you can use the ‘House Way’ button to auto-select your cards. The next stage is to click the ‘Play’ button and the dealer’s hands will be revealed. At this point the respective hands will be compared and any winnings paid out. You will find that a large number of hands end with one win each and therefore a ‘push’. To play again just click the ‘Rebet’ button or use the ‘Clear Table’ button to choose a different stake. Using the best Pai Gow strategy you can raise the RTP to 97.15% and that’s a pretty decent return. It should be noted though that the casino also takes 5% of your win on each round. Pai Gow is an excellent introduction to poker in general; there’s very little to think about (and nothing at all if you use the House Way facility). It’s an interesting diversion from spinning the reels.